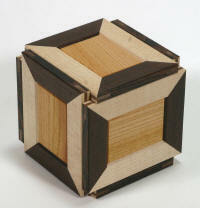 Hideaki Kawashima I’ve enjoyed making things since I was a child. I deconstructed machines such as radios and cameras, observed structures and was interested in geometry. My major was directing light, but I also taught myself geometric structures and made various modular origami models. 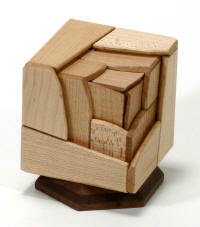 I like combining simple mechanisms to create complicated puzzles. I feel a sense of beauty there. I hope that my products are a way for people to communicate together. It is a remake of "Thaw" (KW-2) made 10 years ago. The device is very simple and the storage space appears slowly like melting ice. It was redesigned as a work of the 2016 Lexus New Takumi Project. It has a ring case. I intended on finishing with Japanese lacquer in the Takumi project, but it was very difficult to control the thickness so I must improve the technique first. 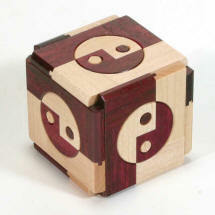 The Cherry wood is colored with dye and pigment. Bars box �U KW-37 This work was designed as a Christmas present for 2018. I redeveloped Bars box (KW-36) and made a new structure. As a Christmas present it has quite a lot of moves. I will likely develop it further in the future. 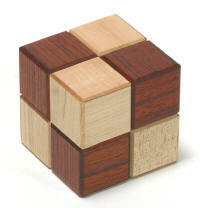 It is characterized by a bar (kan-nuki) arranged on the six sides. 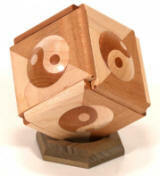 It’s a development of Snake Cube (KW-6). There are many delicate parts, please do not open and close it by force. Please be aware of humidity change as it is especially susceptible to humidity. 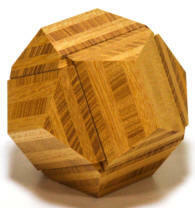 I made it as an intersecting body of a cube and a sphere. I changed the center section from a linear design to a curved one. It took a lot of ingenuity, time and effort to make it accurate. Since this is not a stable work, please put it on the display stand. For me, it’s necessary to take along a camera when traveling. I switched from a film camera to a digital camera, and smart phone. But even now, I still like to pack a film camera in my bag if there is enough room. This work is modeled after the spring camera of the 1950s. 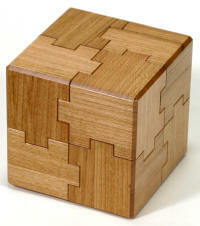 Unlike my ordinary work, this does not include any difficult puzzle. Although it is designed so that a camera strap may be attached, I do not recommend picking it up by the strap or letting it hang from your neck, as the work may not be strong enough to support the total weight. This work is oil-finished. Please be careful as scratches adhere easily. 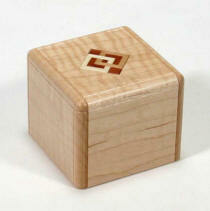 Material :wendge, maple, cherry, keyaki (zelkova), etc. I crossed the two trick boxes and incorporated a nasty trick to it. 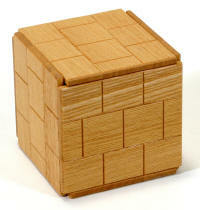 This trick box is difficult because there is no hint on the surface. Please note this work has a pointed portion. 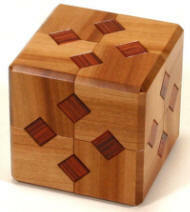 This work is an improved version of Jigsaw Cube (KW - 24). 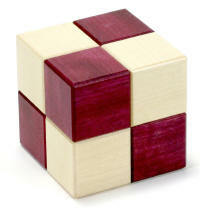 Jigsaw Cube was a confusing box when closing. This work will fascinate you with its beautiful movements. The angle of the decorative part is very important. And I spent a lot of time and effort to process that angle accurately. 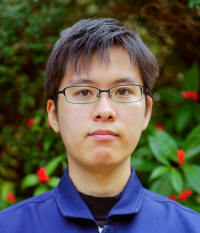 Mr. Iwahara also cooperated in the calculation. I’m grateful for his expertise. 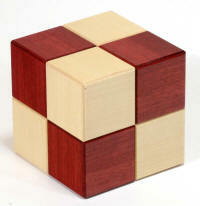 The eight corners of the cube are made of same wood, the same as Jigsaw cube. The surface design was changed from KW-32-1. The trick is the same. This work was designed for an exhibition that theme is "Story". This work does not express the motif for a specific story. book. These kind of stories I could read over and over. Well, can you find all the storage spaces? 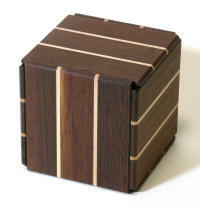 White and black striped Yosegi was provided by Mr. Ninomiya. The surface design and wood were changed from KW-28. The regular dodecahedron puzzle box that I wanted to make since becoming a karakuri artisan has finally been completed. 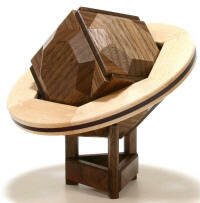 It was finally completed through accumulation of knowledge and technology on machinery, edge tools and jig. 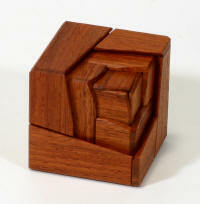 The movement is the same as "pod" (KW-30).It was a structure developed for this work. 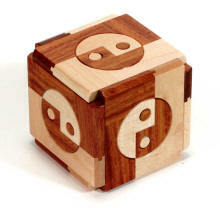 This work has less hints than "pod", so it will be much more difficult. 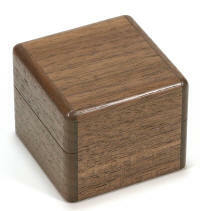 Continuing from last year, it is a work conscious of Mr. Okiyama's twin box (YO-2). The movement is simple, but how to open the lid is tricky. There are three storage spaces in all. pod　(k) KW-30-3 This work was designed for Karakuri Puzzle Party in Hakone 2016. The surface material were changed from KW-30-1. pod　(p) KW-30-2 This work was designed for Karakuri Puzzle Party in Hakone 2016.
pod　(w) KW-30-1 This work was designed for Karakuri Puzzle Party in Hakone 2016. This work is compilation of my techniques that I acquired for 8 years. It takes over 20 moves to open. KW-29-3 I made it as a souvenir of "KPH6". Yosegi in the surface is Yosegi I made for the first time. This is a little more difficult than Accessory box(KW-29-1). 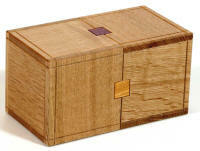 The accessory box made with crepe grain maple. It's made with an ordinary maple next time. 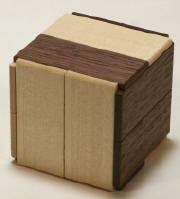 Material :　magnolia, maple(crepe), etc. 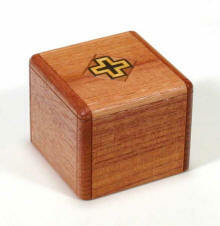 This is a simple accessory box. Originally, this work was designed as a Christmas present. Chanchin is a soft wood. So please handle it gently. Material :　magnolia, chanchin, etc. This work's motif is Planet with Ring I. The planetary ring is hampering the lid from opening. To open the box you will need to remove the planetary ring without force. This work has a small storage space for a ring. This work's motif is the planet Saturn. When a work is put on a stand, it's the same axial tilt as Saturn. A planetary ring makes you puzzled. 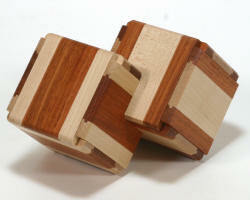 This work has two small storage spaces for rings. 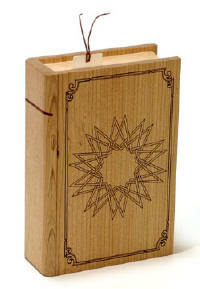 This is the deluxe edition which has double the surface wood. The movement is the same. 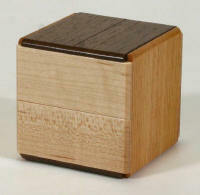 I admired Mr. Okiyama's Twin Box so much I designed this one myself. A mechanism is connected with the surface decoration. There are a lot of lids, so please pay attention when returning them to their proper place. HALF (J) KW-25-2 This work was designed for an exhibition that theme is “2”. In (J), how to open is the same as (D). 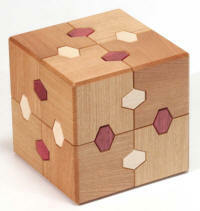 Because the surface designs are different you may feel that (J) is more difficult than (D). HALF (D) KW-25-1 This work was designed for an exhibition that theme is “2”. Duet KW-19-3 It was changed the outside plates for exhibition. 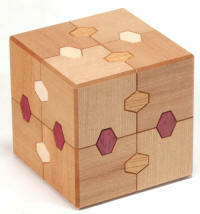 The design of the surface is same as "XY", but the movement is same as conventional "Duet". 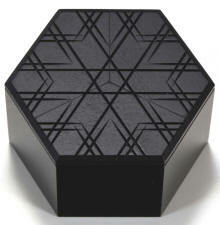 The surface of this box has a characteristic design. 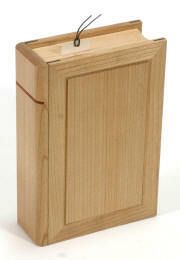 The material of the surface is cherry wood, but it looks like two colors in the reflection of the light. If you rotate it in the palm of your hand you’ll be able to gaze at the colors. The movement is simple, but a lot of time and effort was spent making it. 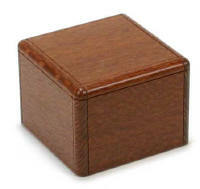 The purpose is the same as Ring box(KW-17),Ring box 2(KW-20). I made this with every mischievousness, but mechanism is simple. Material :　cherry, karin, cloth, etc. This work was designed for Karakuri Party in Hakone 2014. The mechanism is very simple. I placed the diamond so that the grain of wood would look most beautiful. Twin-lens reflex camera KW-21 This work was designed for an exhibition that theme is “Nostalgic”. 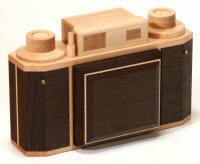 This work was modeled after a Twin-lens camera called, "Lubitel 1", that I bought 10 years ago. 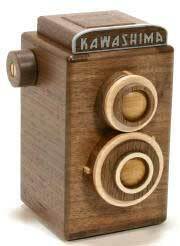 Although this camera was made in the 1950s, it still functions, and a photograph can still be taken. This work needed a lot of round and spherical shaped parts, which I did solely by myself, so I was very nervous. I would prefer never to remake this work again. The nameplate was colored after carrying out the laser processing. Duet KW-19-2 This is a remake of KW-19. The surface design is different. 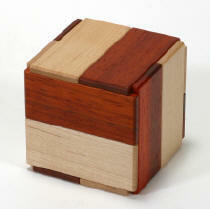 Material :　cherry, magnolia, walnut, maple, etc. 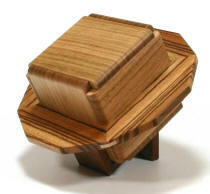 Ring Box 2 KW-20 This work was designed as a Christmas present for 2013. 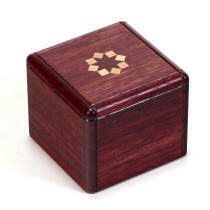 The purpose of almost all karakuri boxes is to open a lid. However, the goal of this box is to take the ring off of the box. 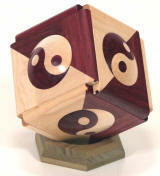 Although the mechanism is different, the purpose is the same as KW-17. ** I have not done any checking of movements other than accessories. It may be impossible to remove it according to the form of the ring. 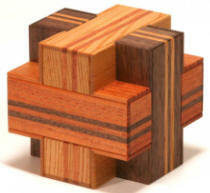 Material :　silky oak, cherry, cloth, etc. Duet KW-19 Two boxes were connected by the internal structure. Although two structures are well alike, it is a mirror copy mutually. ...Probably, it will be more interesting for structure to be in sight. Please enjoy imagining an inner structure. 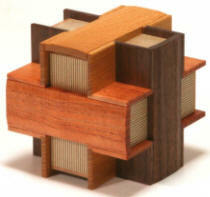 ＸＹ KW-18 This work was designed for Karakuri Party in Hakone 2013. The technique of "tongue and groove joints" are used for surface parts. 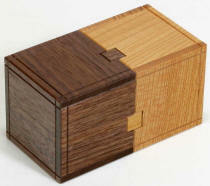 Material : magnolia, maple, walnut, etc. 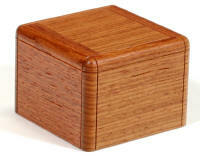 Ring Box (W) KW-17-1 This is a ring box. Please take the ring out of the box. You may propose to your love using this work. However, no matter what the result may bring, I can't take responsibility. *You may be unable to store the ring inside if the form of the ring is special. 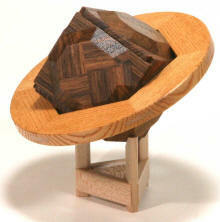 Ring Box (K) KW-17-2 This work was designed for an exhibition theme of "palpitate". I made the ring box. Please take the ring off from the box. You may propose (or as a present) using this work. However, no matter what result it may bring, I can't take the responsibility. *It may be unable to store, if the form of a ring is special. I tried to make this work by continually moving the mechanism. 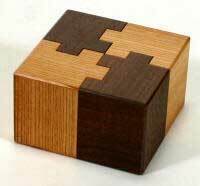 This work's mechanism is the same as a loop. KEY BOOK KW-14-2 This is a remake of KW-14. It was made less complex by getting rid of one design. 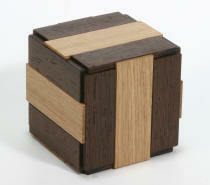 Material : cherry, maple, katsura, rose wood, etc. TWIN 2 KW-15 This work was designed as a Christmas present for 2012. This box is twins' box. Unlike last year, they are close. You will be troubled with this work, if you are used to my past Christmas present. KEY BOOK KW-14 This work was designed for an exhibition that theme was "living". I had wanted to make this work, since joining the Karakuri creation group. 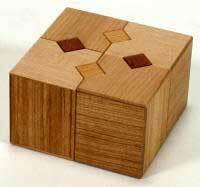 If you find clues, this puzzle is not difficult. 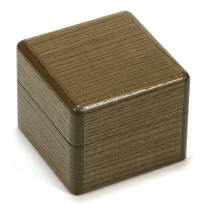 There is no magnet contained in this box, so your magnetic cards can also be stored safely. 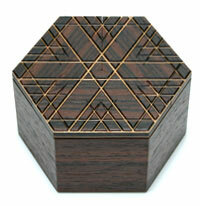 The surface lines are done by laser processing. 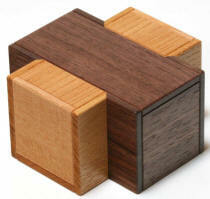 Material : cherry, maple, katsura, etc. Triskele KW-12-2 I remade KW-12. The surface design and a part of lid were changed. Twin KW-13 This work was designed as a Christmas present for 2011. They are bad twins of relations. One side interferes with another side. Kobushi magnolia (surface white plate) is soft wood, please treat gently. I made only 25 pieces for the exhibition. If I made this next time, the surface design will change. This work is a design with deja vu. Please do not beat bottom plate. All plate have dummy movement, and it takes 6 move to open. CUBE KW2 mini KW-10 This is small size CUBE KW2 (KW-9). The movement is same. The production time and accuracy were demanded. 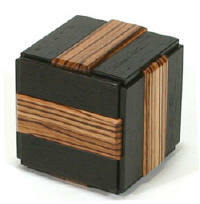 CUBE KW2 KW-9 This work is a deluxe edition of the Karakuri Cube series. I enlarged the cubic edge by 12 millimeters. I made a completely new structure and storage space. 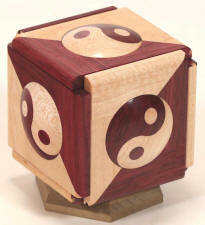 The movement and the storage space are new to the Karakuri Cube series. 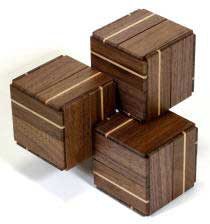 Three-cornered deadlock KW-8 Three cubes are connected. 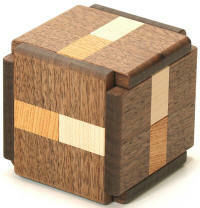 This box is completely different from Snake Cube(KW-6). I developed completely new mechanism. I remade KW-8. 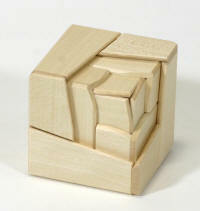 Simplification of an internal structure and a surface design were changed. The movements are same. some of the inside parts have been painted with lacquer. 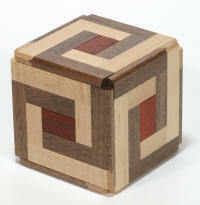 This work was designed as a Christmas present for 2010. 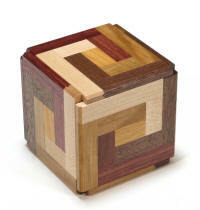 The title of this box "snake" comes from the coloration of this box.I chose the best pattern and the best mechanism from many combinations. 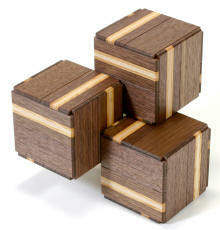 This work is an improved version of the Karakuri Cube series. 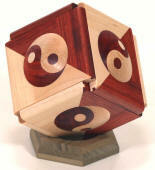 The mechanism is the same, but the rotations are different. The design of the petals were changed and the stand was abolished. 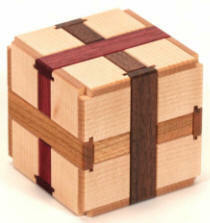 The material was changed from KW-4-2-1 (Rosewood). 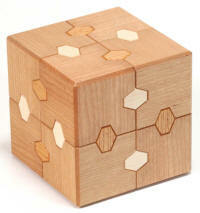 The material was changed from KW-4-2-1 (mizuki (dogwood)). 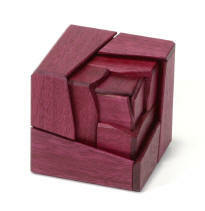 The material was changed from KW-4-2-1 (purple heart). I chose “Rose” as the motif for the exhibition at Matsuya Ginza. The theme of the exhibition was “Sweets”. I feel the sweet atmosphere in the Rose. It isn’t difficult to open. KW-3 This work was originally made as a Christmas present for 2009. 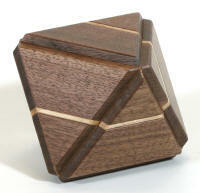 It's shaped as a regular octahedron, but it has the base of a cube.It isn't difficult to open.But be careful not to tip the item which is inside.You won't understand which is the top or bottom of the box until you take the lid off. Thaw KW-2 It was designed for the exhibition theme of "spring". The motif is a snowy crystal. The device is very simple. When a thaw comes, ...? 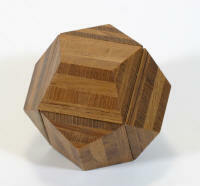 Regular dodecahedron box (turntable) KW-1 It looks like a Regular dodecahedron. 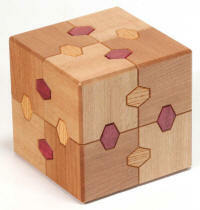 But, the box's basic mechanism is a cube. 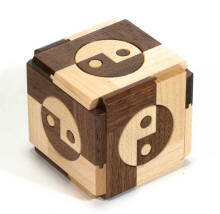 There are 6 faces on the cube. We can turn the 5 plates in order. When you turn them in the correct way, you can open the other face that is the cover. But, when you move it in the wrong way, it takes about 20 moves!